Thank you Duff! 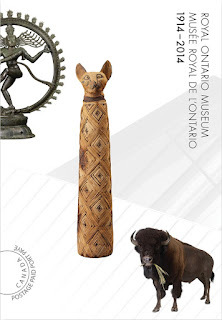 Prepaid postcard with one of the two 2014 stamps commemorating the Royal Ontario Museum's centenary. Unfortunately, Canada Post does not provide the accession numbers or further information on the artifacts, other than above is a 'Shiva Natajara Sculpture, Mummified Cat and Bison'. In addition to this card, booklets and s/s were issued.